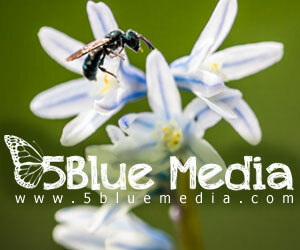 Humans as a species have evolved to live firmly on the ground. Though the human body is not capable of flight, our large brain makes us highly efficient tool makers and problem solvers. 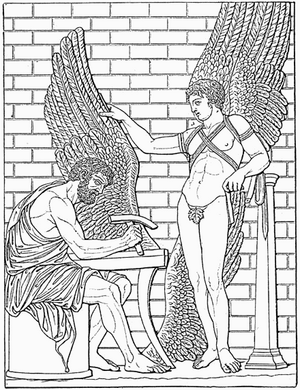 The early Greeks told the story of Daedalus and Ikarus longing to fly like the birds as an early example of humans building contraptions to help us soar in the sky. Beginning with the hot air balloon and progressing to open cockpit and finally enclosed cabin aircraft, humans created machines to allow for human flight. Increasing in altitude meant very cold temperatures which were overcome by warm clothing and enclosed, heated cabins. Rising high into the sky also makes it difficult to breathe as the air becomes less dense and contains less oxygen the higher one rises in altitude. At very high altitudes we experience a potentially fatal lack of oxygen, something mountain climbers long noted as the death zone. Aircraft are fitted with an oxygen supply to allow for flight above this critical altitude. Today, planes are built with a pressurized cabin so they could be flown far above the altitude the human body could otherwise survive. Clearly people live at high altitudes without serious harm, but at what point does being at a high altitude become a problem? 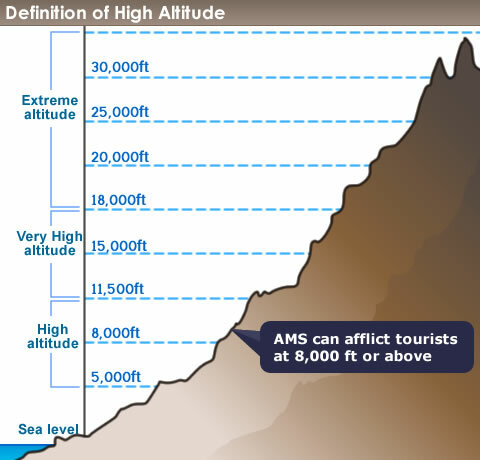 High altitude is considered anything 5000 ft above sea level. At this height the less dense air contains less oxygen and the effects of high altitude sickness start to become apparent. For reasons not well understood, some people are more susceptible to this than others. Increasing altitude to 11,000 ft above sea level commonly leads to severe altitude sickness, also known as acute mountain sickness (AMS). Any lung related conditions can become dangerous at this level. Extreme altitude is anything over 18,000 ft above sea level and humans cannot long survive at such heights without access to a supplemental oxygen supply. Physiologically, the problem is one of gas exchange between the gasses in the alveoli and the pulmonary capillaries. Normally during inspiration, oxygen moves into the alveoli where it then passes into the bloodstream in exchange for CO2 which is then expired out of the alveoli. Normally there is a high diffusion gradient of O2 inside the alveoli compared to the capillaries. Thus O2 comes to equilibrium by moving into the bloodstream. At high altitudes the concentration of O2 in the air is much lower so the normal gradient is much reduced leading to less chance for O2 to enter the bloodstream. The blood becomes less saturated with O2 and acute hypobaric hypoxia results. There are graphs that show the relationship between barometric pressure and oxygen saturation in the bloodstream at increasing altitudes. Generally speaking, oxygen saturation only drops a little up to a certain altitude and then it drops off quite rapidly at higher altitudes. These physiological considerations are vital when it comes to designing aircraft that safely and comfortably transport people from one place to another. To allow aircraft to fly up to 40,000 feet they must be pressurized to simulate a much lower altitude. Most people can tolerate the air pressure equivalent to being at 8000 feet in altitude. There is about 25% less oxygen available at this altitude compared to what is present at sea level. Airplanes are typically pressurized to equal this level of 8000 feet even though the plane is flying much higher than this, particularly on the bigger jets on longer flights. As the plane ascends and descends pressure changes occur on both sides of the eardrum leading to an uncomfortable squeezing sensation. This sometimes painful discomfort is relieved by opening and closing the mouth repeatedly until the ears “pop”. In other words the pressure in the inner ear is equalized by air flowing in and out if the Eustachian tubes. Some people are sensitive to this process if the tubes are partially blocked. Such considerations are not limited to flying in commercial aircraft. Sometimes humans try things at the extremes of possibility just to see if it can be done. For example, a few have tried feats of circumnavigation of the globe in hot air balloons. 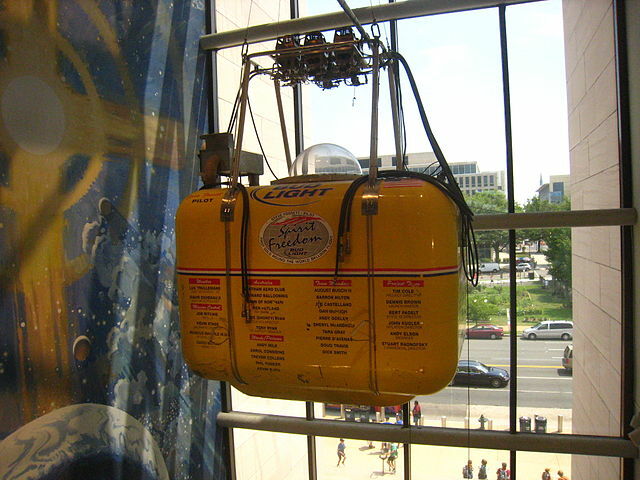 A special capsule is needed, like the one Steve Fossett used with his Spirit of Freedom balloon on his record setting round the world flight, to cope with the lack of oxygen and cold temperatures. While parachuting is seen by many as thrilling sport, most commercial operations only allow jumps up to 13,00 feet. An extreme version called HALO jumping (High Altitude Low Opening) is reserved for military operations where secrecy is valued. Special equipment using oxygen tanks and special training is necessary to make the process of falling from 35,000 feet safer for soldiers. At those heights a jumper can suffer from decompression sickness. Due to air pressure differences, nitrogen is forced out of tissues into the bloodstream where it forms bubbles leading to severe joint pain, dizziness, confusion or seizures and possibly death. To combat this parachutists will breathe pure oxygen prior to taking off to remove nitrogen from the bloodstream. Even a single breath of normal air can introduce enough nitrogen into the body to cause symptoms of decompression sickness. This article was prepared to support the release of the Michael Windelspecht’s Human Biology text.